Fluid-feeding insects have the ability to acquire minute quantities of liquids from porous surfaces. This protocol describes a method to directly determine the ability for insects to ingest liquids from porous surfaces using feeding solutions with fluorescent, magnetic nanoparticles. Lehnert, M. S., Reiter, K. E., Bennett, A., Gerard, P. D., Wei, Q. H., Byler, M., Yan, H., Lee, W. K. The Ingestion of Fluorescent, Magnetic Nanoparticles for Determining Fluid-uptake Abilities in Insects. J. Vis. Exp. (130), e56619, doi:10.3791/56619 (2017). Fluid-feeding insects ingest a variety of liquids, which are present in the environment as pools, films, or confined to small pores. Studies of liquid acquisition require assessing mouthpart structure and function relationships; however, fluid uptake mechanisms are historically inferred from observations of structural architecture, sometimes unaccompanied with experimental evidence. Here, we report a novel method for assessing fluid-uptake abilities with butterflies (Lepidoptera) and flies (Diptera) using small amounts of liquids. Insects are fed with a 20% sucrose solution mixed with fluorescent, magnetic nanoparticles from filter papers of specific pore sizes. The crop (internal structure used for storing fluids) is removed from the insect and placed on a confocal microscope. A magnet is waved by the crop to determine the presence of nanoparticles, which indicate if the insects are able to ingest fluids. This methodology is used to reveal a widespread feeding mechanism (capillary action and liquid bridge formation) that is potentially shared among Lepidoptera and Diptera when feeding from porous surfaces. In addition, this method can be used for studies of feeding mechanisms among a variety of fluid-feeding insects, including those important in disease transmission and biomimetics, and potentially other studies that involve nano- or micro-sized conduits where liquid transport requires verification. Many insect groups have mouthparts (proboscises) adapted for feeding on fluids, such as nectar, rotting fruit, sap flows (e.g. Diptera1, Lepidoptera2, Hymenoptera3), xylem (Hemiptera4), tears (Lepidoptera5), and blood (Phthiraptera6, Siphonaptera7, Diptera7, Hemiptera8, Lepidoptera9). The ability of insects to feed on fluids is relevant to ecosystem health (e.g. pollination10), disease transmission4,11, biodiversification2,12, and studies of convergent evolution13. Despite the wide variety of food sources, a theme among some fluid-feeding insects is the ability to acquire small amounts of fluids, which could be confined to micro- or nano-sized droplets, liquid films, or porous surfaces. Given the extensive diversity of fluid-feeding insects (more than 20% of all animal species14,15) and their ability to feed on a variety of food sources, understanding their feeding behaviors and fluid-uptake mechanisms is important in many fields. Insect mouthpart functionality, for instance, has played a role in the development of biomimetic technology, e.g., microfluidic devices that can perform tasks such as the acquisition of small amounts of fluids using methods similar to those employed by insects16. A fundamental problem in the studies of fluid uptake mechanisms, however, is determining not only how insects feed on fluids, but acquiring experimental evidence that supports the mechanism. Solely using behavior (e.g., probing with the proboscis12,17) as an indicator for feeding is insufficient because it does not confirm the successful uptake of fluids, nor does it provide a means to determine the route that fluids travel as they pass through the insect. In addition, performing experiments with small quantities of fluids better represents natural feeding scenarios where fluids are a limiting resource2,12. X-ray phase contrast imaging was used with the Monarch butterfly (Danaus plexippus L.) to assess how butterflies feed on small amounts of fluids from porous surfaces12. Monarch butterflies use capillary action via spaces between cuticular projections (dorsal legulae) along the proboscis to bring fluids confined to small pores into the food canal. The incoming fluids form a film on the food canal wall that grows and collapses into a liquid bridge by Plateau instability12,18, which is then transported to the butterfly's gut by action of the sucking pump in the head. Although x-ray phase contrast imaging is an optimal tool for visualizing fluid flow inside insects12,19,20,21, the technique is not readily available and a more convenient method is needed for rapid assessment of an insect's ability to uptake fluids and ingest them. To determine if the feeding mechanism for D. plexippus applies to other Lepidoptera and also to flies (Diptera) (both groups feed on liquids from porous surfaces), Lehnert et al.13 applied a technique for assessing an insect's ability to feed on small amounts of fluids from porous surfaces, which is reported in detail here. Although the protocol outlined here is for studies that use wetted and porous surfaces, the methodology can be altered for other studies, such as those addressing pool-feeding mechanisms. In addition, the applications extend to other fields, including microfluidics and bioinspired technology. NOTE: Cabbage butterflies (Pieris rapae L., Pieridae) are selected as the species of representative Lepidoptera because they have been used in previous studies of fluid-uptake abilities and mouthpart morphology22,23. House flies (Musca domestica L., Muscidae) and blue bottle flies (Calliphora vomitoria L., Calliphoridae) are used because they are often observed feeding on porous surfaces13. Order P. rapae as larvae from an insect supplier and rear them on artificial diet (see Table of Materials) until they pupate and emerge as adults in an environmental chamber set to 23 °C and a 18L:6D photoperiod. Order M. domestica and C. vomitoria as pupae and rear them at the same environmental conditions as P. rapae. Do not feed adult butterflies and flies after they emerge from the pupae prior to the feeding experiments. Prepare a 20% sucrose solution (control) and a 20% sucrose nanoparticle solution to test for fluid uptake. Prepare the nanoparticle solution by adding fluorescent magnetic nanoparticles (iron oxide with a polyacrylic acid coating, approximately 20 nm in diameter)24 to a 20% sucrose solution (1 mg/mL dH2O nanoparticles with 20% sucrose solution, 1:1). Prepare a 1x solution of phosphate buffered saline (PBS) (10x diluted to 1x in dH2O, pH 7.4), which is used for dissections. Set up a feeding station that consists of a manual manipulator with a clamp and a separate feeding stage (a flat platform) (Figure 1). Place a concave slide on the feeding stage and have nylon net filters with pore size diameters of 11, 20, 30, 41, or 60 µm and membrane filters with pores size diameters of 1, 5, 8, or 10 µm nearby for the feeding experiments. Wrap the insect's bodies, legs, and wings into a folded tissue paper. Position the insect so that only the head and mouthparts are exposed. Place the wings of the insect between two microscope slides, which are held together by the clamp on the manipulator so that the insect is suspended above the feeding stage (Figure 1). Administer a 30 µL droplet of either the 20% sucrose solution or the 20% sucrose nanoparticle solution with a micropipette to the center of the concave slide. Place a single filter paper of a specific pore size onto the concave slide so that the center of the filter paper is aligned with the droplet of the nanoparticle solution. The contact between the droplet and the filter paper results in the solution spreading along the filter paper, filling the pores (Figure 1). NOTE: The filter paper is placed on top of the droplet, rather than the other way around, to minimize the potential presence of nanoparticles on top of the filter paper where the insects feed. Position the insect with the manipulator so that only the distal regions of the mouthparts can contact the wetted filter paper on the feeding stage (Figure 1). Use an insect pin to extend the mouthparts onto the filter paper and allow the insect to feed for 45 s.
To minimize the chance of insects feeding on liquid films that might be present on the surface of the filter paper, position the mouthparts so that they are in contact with a part of the filter paper that is touching the flat part of the slide (i.e., not directly above the concave part of the slide). If the insect does not express an interest in feeding, the mouthparts can be held to the filter paper with the insect pin for the duration of the feeding time. Place the PBS solution in a 50 mm watch glass so that there is enough solution to cover the insect's body. Place the watch glass under a stereoscope and position insect dissecting equipment (spring micro dissecting scissors, insect pins, fine point dissecting forceps) next to the stereoscope. After feeding, remove the insect from the tissue paper and hold it with wings closed. Remove the head, legs, and wings of the insect with the spring micro dissecting scissors and place the insect in the PBS solution in the watch glass (Figure 2). If needed, anesthetize insects before dissections. Use forceps to hold the insect by the cuticle near the distal region of the abdomen. With the dominant hand, use the spring micro dissecting scissors to cut the cuticle in an anterior direction along the lateral side of the abdomen, starting at the posterior end, until the thorax is reached. Take special care to ensure that only the cuticle is cut and that the alimentary canal inside the insect is not damaged (Figure 2). Make additional cuts of the cuticle with the dissecting scissors to open the abdomen to reveal the alimentary canal inside (Figure 2). Remove the abdominal cuticle, fat body, and other structures with the assistance of insect pins and relocate them outside of the watch glass for subsequent disposal, leaving only the thorax and alimentary canal in the watch glass. NOTE: The dissection will reveal the crop, which is a sac-like structure (an extension of the alimentary canal) located near the juncture of the thorax and abdomen. If the crop is not exposed, make additional incisions into the thorax with the scissors until the crop is revealed. Once the crop is visible, cut away the remaining parts of the insect leaving only the alimentary canal with the crop in the watch glass (Figure 2). NOTE: The lepidopteran crop is nearly transparent and cellophane-like in nature, which might be difficult to recognize if it is not filled with fluids and expanded or if it is cut during the dissection. Use fine point dissecting forceps to place the crop onto a coverslip (24 mm x 24 mm) for subsequent imaging (Figure 2). Position the crop on the coverslip with the fine point dissecting forceps using care to prevent rupturing the crop. Use the CY3 channel (or phase contrast) on an inverted confocal microscope for imaging at 20X magnification. Image the crop immediately after dissection to prevent it from drying out. Hold a magnetic stir bar (41.3 mm in length and 8 mm in diameter) in the hand that is not in control of the operating stage of the microscope. Wave the magnetic stir bar back and forth near the crop (approximately 10 mm distance from crop) so that each back and forth motion takes approximately one second (Figure 2). While the magnetic stir bar is waved, inspect the crop for the nanoparticles. Slowly move the operating stage back and forth while looking through the ocular lens of the microscope for nanoparticle movement inside the nearly transparent crop. If the nanoparticles are present in the crop, indicating positive feeding, they will respond and wave in unison with the magnetic stir bar (Figure 2). The study of patterns in fluid-uptake abilities among fluid-feeding insects requires determination of when feeding occurs. The protocol outlined here is used to test the limiting pore size hypothesis among Lepidoptera and Diptera13. The limiting pore size hypothesis states that fluid-feeding insects cannot feed from liquid-filled pores if the pore size diameter is smaller than the diameter of the feeding conduits12. Incoming fluids from the porous surface must form a stable liquid bridge, via Plateau instability18, to overcome the capillary pressure keeping the liquids in the pores and to provide a liquid surface for the sucking pump to act on. Insects with feeding conduits of different sizes (Figure 3) are predicted to differ in the smallest pore size from which they can feed. The limiting pore size for each species is calculated based on the ability for 50% of the tested individuals to feed on a specific pore size of the filter paper13. Insects fed the 20% sucrose solution (control) did not have nanoparticles in their crops. After insects were dissected to assess if nanoparticles were ingested, their mouthparts were imaged with a confocal microscope to measure the conduits in the distal and proximal regions (Figure 3). Distal and proximal measurements were made because it might serve as an indicator of the critical location where fluids enter the mouthparts, i.e., a close relationship between mouthpart conduit sizes and limiting pore size could provide indirect evidence for mouthpart structures that facilitate capillary action. 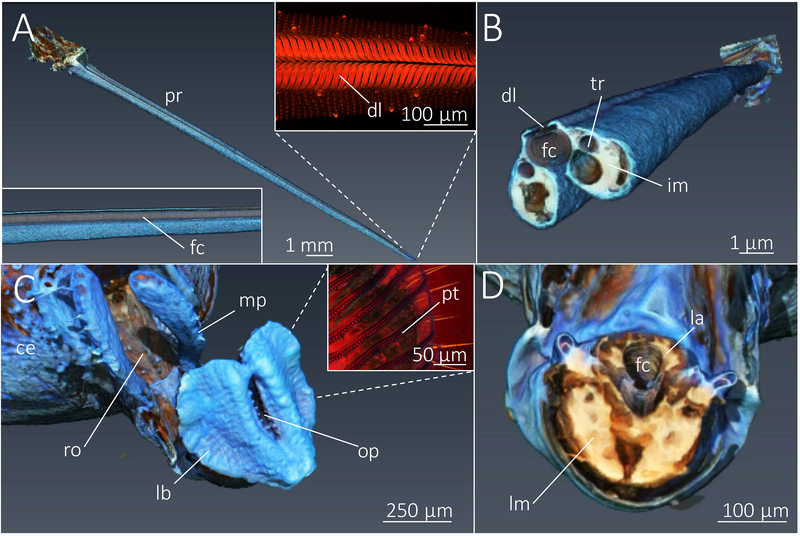 The diameters of the food canal for proboscises of P. rapae were measured near the tip region (distal measurement) and at 30% of the proboscis length (proximal region). The mean diameter of five pseudotracheae was used as the distal measurement and the diameter of the oral opening was measured as the proximal measurement for each fly specimen. 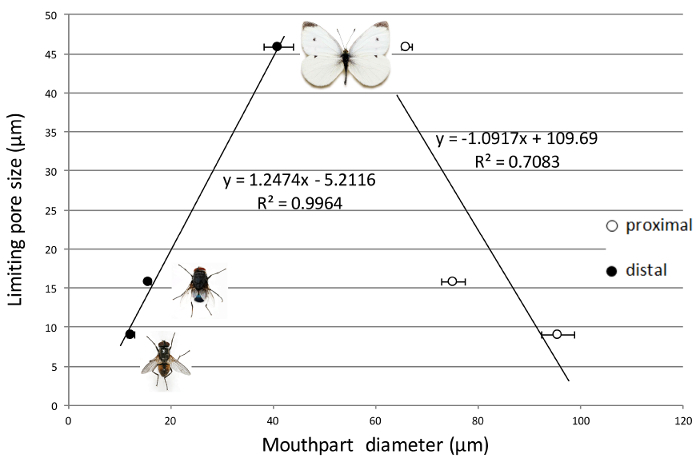 This protocol revealed a close relationship between distal mouthpart conduit sizes and the smallest pore size from which insects can feed (Figure 4). Evidence indicated that fluid uptake for the dipteran species first occurs in the pseudotracheae (distal mouthpart measurement) rather than the oral opening (proximal mouthpart measurement) when feeding from porous surfaces (Figure 4). Interestingly, the structural architecture of the pseudotracheae is similar to that of lepidopteran mouthparts and consists of cuticular structures that might promote fluid uptake through capillary action, an example of convergent evolution13. The close relationship between the limiting pore size and mouthpart conduit sizes provides evidence that supports capillary action as an important component for fluid uptake among Lepidoptera and Diptera. Figure 1: Experimental setup and feeding station. (A) The setup consists of wrapping the insect in a tissue paper (tp) and placing the insect's wings between two slides (sl), which are held together by a clamp (cl) attached to a manipulator (ma) with adjustable knobs (ak). The insect's proboscis (pr) is lowered to a feeding stage (st), which has a filter paper (fp) that is placed onto a droplet (dr) of the nanoparticle solution that is administered to a concave slide (cs). (B) Schematic showing the placement of the droplet and filter paper onto the concave slide. (C) The droplet of the nanoparticle solution spreads (arrows) through the filter paper via capillary action to create a porous feeding surface. (D) Fluorescent microscope image of dorsal view of isopore filter showing pores (po) (10 µm) with nanoparticle solution (20X magnification, CY3 channel). No liquid film was observed on the surface. (E) Confocal microscope z-stack image showing nanoparticle solution (ns) in the pores of the isopore filter (10 µm). Please click here to view a larger version of this figure. Figure 2: Dissection and nanoparticle detection. (A) Forceps (fo) are used to secure the insect (M. domestica shown here, fl). (B) The insect's wings, head, and legs are removed. (C) Scissors (sc) are used to cut open the lateral side of the abdomen. (D) Reproductive structures (eggs, eg) and unneeded parts of the alimentary canal are removed with additional forceps. (E) Additional structures are removed to isolate the crop (cr). (F) Isolated crop ready for detecting the presence of nanoparticles. (G) The crop is placed onto a cover slip (cs) and is moved to an inverted confocal microscope. A magnetic stir bar (ma) is waved near the crop to cause nanoparticle movement. (H) Nanoparticle movement (outlined in red circles) in the crop of C. vomitoria with phase contrast microscopy. Please click here to view a larger version of this figure. Figure 3: Lepidoperan and dipteran mouthpart structures. (A) Laser ablation tomography image showing the lepidopteran proboscis (pr), which is composed of two elongated maxillary galeae that come together by linking structures (legulae) that create a food canal (fc) for fluid uptake. The inset (confocal microscope image) shows the dorsal legulae (dl) near the distal region of the proboscis. The spaces between the dorsal legulae provide capillary action to bring fluids into the food canal. (B) Each C-shaped galea has a trachea (tr), nerve, and intrinsic musculature (im). (C) Dipteran mouthparts consist of a rostrum (ro), haustellum, and a distal labellum (lb) that has small conduits, pseudotracheae (pt) (shown in confocal image in inset), which radiate from a central oral opening (op). The laser ablation tomography image also shows the compound eye (ce) and the maxillary palpi (mp). (D) The food canal, which connects to the oral opening is partially composed of the labrum (la) and the labium (lm). Please click here to view a larger version of this figure. Figure 4: Relationship between insect mouthparts and pore sizes from which they can feed. The limiting pore size is related to the diameter (mean ± SEM) of the distal mouthpart conduits rather than the proximal food canals. Musca domestica is shown below C. vomitoria. Please click here to view a larger version of this figure. Insect mouthpart functionality is historically inferred from studies of gross morphology (e.g., lepidopteran proboscis functionality related to a drinking straw25,26); however, recent studies that incorporate experimental evidence have resulted in a paradigm shift in our understanding of the complexities of insect mouthparts and structure-function relationships2,12,13,22,27. Although modern imaging techniques, such as scanning electron microscopy23, confocal microscopy22, micro computed tomography (micro-CT)28, and laser ablation tomography (Figure 3), provide opportunities for detailed studies of morphology, evidence for functionality should be accompanied with experimentation. The method described here reveals that capillarity might be an essential mechanism employed by insects when feeding from wetted porous surfaces. Using feeding behavior (e.g., probing12,17) alone would not have revealed this feeding mechanism, as some individuals that probed surfaces with their mouthparts were unable to feed, particularly those provided filter papers with pore size diameters smaller than the diameter of the mouthpart conduits. In addition, inspection of the crop to determine if it was fluid filled also would be insufficient, as the amount of liquids ingested in these experiments were too small for visual assessment, i.e., the crops of some insects appeared deflated, but nanoparticles were still present indicating that fluids were ingested. The ability to handle small insects, manipulate their mouthparts with an insect pin, and perform careful dissections represent some of the critical steps and limitations of the described methodology. There were instances, for example, where dissections resulted in cutting the crop, which rendered the insect unusable for the study because the contents of the crop (possibly containing the nanoparticle solution) mixed with the PBS solution in the watch glass, making it difficult to verify the ingestion of nanoparticles. In addition, the auto fluorescence of the insect cuticle can interfere with using fluorescent microscopy as the only means to visualize the nanoparticles; however, confocal imaging with phase contrast eliminated this issue and provided another means for visual assessment (Figure 2), which also highlights why using magnetic nanoparticles is optimal as opposed to only fluorescent nanoparticles. Although this protocol provides a means to assess the ability for insects to ingest fluids, one of the limitations is that it does not provide a means to visualize the nanoparticles while they are being ingested; therefore, eliminating the possibility for studying the fluid dynamics during the uptake process. The technique described here provides a method for assessing the ability of insects to ingest small amounts of fluids. Given the enormous diversity of fluid-feeding insects, this protocol could be employed in other studies of insects with micro- and nano-sized conduits in their mouthparts. In addition, future studies could use a similar technique to determine the path that fluids travel through the alimentary canal, e.g., bypassing the crop as observed in some blood-feeding insects, or studies that examine how long fluids remain in particular structures, such as the midgut or hindgut, as long as the time between feeding, dissections, and imaging are taken into account. This work was supported by National Science Foundation (NSF) grant no. IOS 1354956. We thank Dr. Andrew D. Warren (McGuire Center for Lepidoptera and Biodiversity, Florida Museum of Natural History, University of Florida) for permission to use the butterfly images. Vijaysegaran, S., Walter, G. H., Drew, R. A. I. Mouthpart structure, feeding mechanisms, and natural food sources of adult Bactrocera (Diptera: Tephritidae). Ann Entomol Soc Am. 90, 184-201 (1997). Lehnert, M. S., Monaenkova, D., Andrukh, T., Beard, C. E., Adler, P. H., Kornev, K. G. Hydrophobic-hydrophilic dichotomy of the butterfly proboscis. J R Soc Interface. 10, 1-10 (2013). 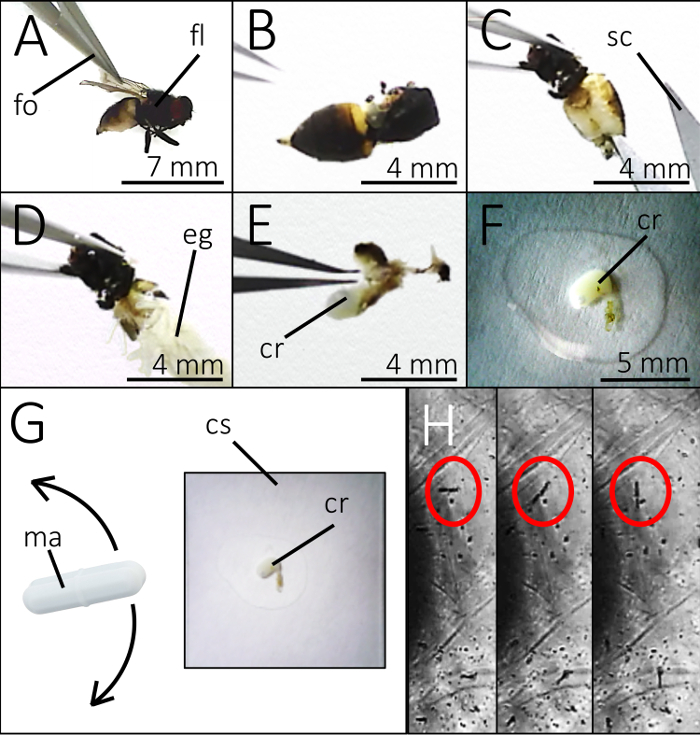 Zhao, J., Wu, J., Yan, S. Erection mechanism of glossal hairs during honeybee feeding. J Theor biol. 386, 62-68 (2015). Redak, R. A., Purcell, A. H., Lopes, J. R. S., Blua, M. J., Mizell, R. F. 3rd, Andersen, P. C. The biology of xylem fluid-feeding insect vectors of Xylella fastidiosa and their relation to disease epidemiology. Ann. Review Entomol. 49, 243-270 (2004). Büttiker, W., Krenn, H. W., Putterill, J. F. The proboscis of eye-frequenting and piercing Lepidoptera (Insecta). Zoomorphology. 116, 77-83 (1996). Light, J. E., Smith, V. S., Allen, J. M., Durden, L. A., Reed, D. L. Evolutionary history of mammalian sucking lice (Phthiraptera: Anoplura). BMC Evol Biol. 10, (2010). Krenn, H. W., Aspock, H. Form, function and evolution of the mouthparts of blood-feeding Arthropoda. Arthropod Struct Dev. 41, 101-118 (2012). Lehnert, M. P., Pereira, R. M., Koehler, P. G., Walker, W., Lehnert, M. S. Control of Cimex lectularius using heat combined with dichlorvos resin strips. Med Vet Entomol. 25, 460-464 (2011). Zaspel, J. M., Kononenko, V. S., Goldstein, P. Z. Another blood feeder? Experimental feeding of a fruit-piercing moth species on human blood in the Primorye Territory of far eastern Russia (Lepidoptera: Noctuidae: Calpinae). J Insect Behav. 20, 437-451 (2007). Barth, F. G. Insects and flowers: the biology of a partnership. Princeton University Press. Princeton. (1991). Foil, L. D., Adams, W. V., McManus, J. M., Issel, C. J. Bloodmeal residues on mouthparts of Tabanus fuscicostatus (Diptera: Tabanidae) and the potential for mechanical transmission of pathogens. J Med Entomol. 24, 613-616 (1987). Monaenkova, D., et al. Butterfly proboscis: combining a drinking straw with a nanosponge facilitated diversification of feeding habits. J R Soc Interface. 9, 720-726 (2012). Lehnert, M. S., et al. Mouthpart conduit sizes of fluid-feeding insects determine the ability to feed from pores. Proc. R. Soc. B. 284, (2017). Grimaldi, D., Engel, M. S. Evolution of the insects. Cambridge University Press. New York, NY. (2005). Adler, P. H., Foottit, R. G. Insect biodiversity: science and society. Wiley Blackwell. Chichester, UK. (2009). Tsai, C. C., et al. Nanoporous artificial proboscis for probing minute amount of liquids. Nanoscale. 3, (2011). Krenn, H. W. Proboscis sensilla in Vanessa cardui (Nympahlidae, Lepidoptera): Functional morphology and significance of flower-probing. Zoomorphology. 118, 23-30 (1998). Plateau, J. A. F. Experimental and theoretical researches on the figures of equilibrium of liquid mass withdrawn from the action of gravity. (Transl). Annual Report of the Board Regents Smithsonian Institution. Government Printing Office. Washington, DC. 207-285 (1863). Socha, J. J., Westneat, M. W., Harrison, J. F., Waters, J. S., Lee, W. -K. Real-time phase-contrast x-ray imaging: a new technique for the study of animal form and function. BMC Biol. 5, 6 (2007). Westneat, M. W., Socha, J. J., Lee, W. -K. Advances in biological structure, function and physiology using synchrotron x-ray imaging. Annu Rev Physiol. 70, 119-142 (2008). Lee, W. -K., Socha, J. J. 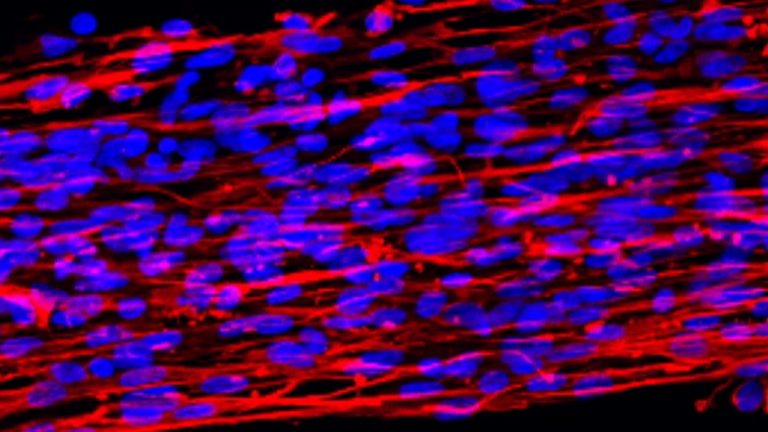 Direct visualization of hemolymph flow in the heart of a grasshopper (Schistocerca americana). BMC Physiology. 9, 2 (2009). Lehnert, M. S., Mulvane, C. P., Brother, A. Mouthpart separation does not impede butterfly feeding. Arthropod Struct Dev. 43, 97-102 (2014). Lehnert, M. S., Beard, C. E., Gerard, P. D., Kornev, K. G., Adler, P. H. Structure of the lepidopteran proboscis in relation to feeding guild. J Morphol. 277, 167-182 (2016). Yan, H., Sung, B., Kim, M. -H., Kim, C. A novel strategy for functionalizable photoluminescent magnetic nanoparticles. Mater. Res. Express. 1, 045032 (2014). Kingsolver, J. G., Daniel, T. L. On the mechanics and energetics of nectar feeding in butterflies. J Theor Biol. 76, 167-179 (1979). Krenn, H. W. Feeding mechanisms of adult Lepidoptera: Structure, function, and evolution of the mouthparts. Ann Rev Entomol. 55, 307-327 (2010). Tsai, C. -C., Monaenkova, D., Beard, C. E., Adler, P. H., Kornev, K. G. Paradox of the drinking-straw model of the butterfly proboscis. J Exp Biol. 217, 2130-2138 (2014). Bauder, J. A. S., Handschuh, S., Metscher, B. D., Krenn, H. W. Functional morphology of the feeding apparatus and evolution of proboscis length in metalmark butterflies (Lepidoptera: Riodinidae). Biol J Linn Soc. 110, 291-304 (2013).